Working in harmony with the land and nature, the Hudson Valley Rice Project at Ever-Growing Family Farm is committed to sustainable local grain production in order to provide our community with freshly-milled rice. Utilizing ecological farming practices, our paddies increase biodiversity, improve food security, and reduce our carbon footprint. This project was born in 2014 and is the the brainchild of husband and wife team Nfamara Badjie and Dawn Hoyte. Nfamara, his cousin Moustapha Diedhiou, and his son Malick Badjie, are all members of the Jola tribe of the Senegambian region of West Africa. 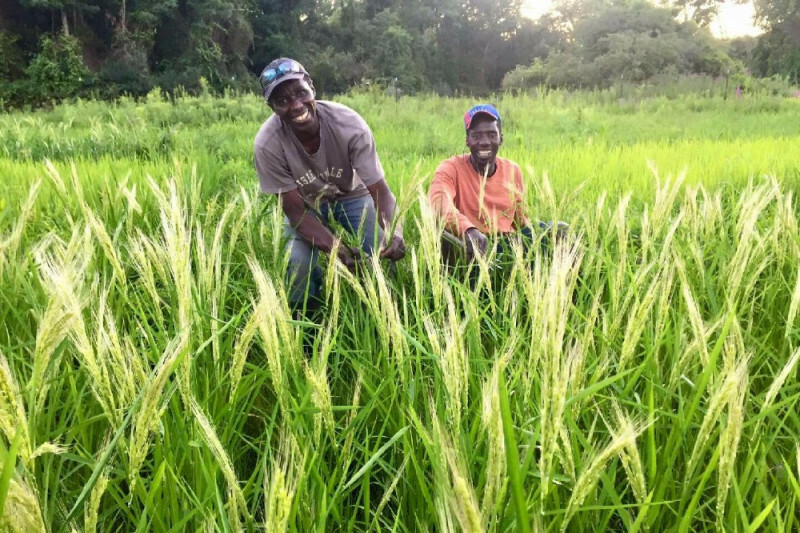 Fortunate to have the wisdom and experience of these master rice-farmers, the Ever-Growing Family Farm has been using traditional hand-cultivation practices to successfully produce a variety of rices on about a 1/2 acre of paddies here in the Hudson Valley. We are seeking funding to expand our size, increase our yield, and improve processing so we may continue to provide this unique product of fresh rice for our community. For the past two years, we hand-cut each rice shaft, dried the rice throughout our home, hand-threshed and wind-winnowed it, then hauled our harvest up to Vermont's Champlain Valley to utilize a gracious colleague’s milling equipment. We enjoyed using these traditional methods and will continue to host community events so that people can participate in planting and harvesting and can see first-hand where rice comes from and experience authentic West African cultural practices. In order increase our yield and take our farm to the next level, we need to purchase some equipment. Small-scale rice equipment is not readily available in the United States (as it elsewhere in the world) because we live in the land of agri-business. Join our efforts as part of the growing local food movement. Help us grow food for our community by helping us purchase much needed equipment to continue to develop and maintain our harvest. We are blessed that our colleague in Vermont sourced slightly used, small-scale equipment for us, to be shipped from Japan with his order this spring. Our Wish List includes: a cleaner/huller, a mill, a brown-rice polisher, a binder (a walk-beside small machine that cuts and ties bundles during harvest), paddy wheels (to allow us to use our push tiller in the deep mud), and materials to enclose the barn to create a processing area. Thank you so very much for your support in helping our farm become a source of sustainably-produced rice for our community! Check out Eve Fox's great article on our farm! Great initiative .. I wish you the best of luck! I am curious to taste this kind of rice i don't know! Hope you get more than you ever imagined. Not long ago their was an article in the WSJ that basically condemned anyone who opposes GMOs particularly in Africa. GMOs were touted as the savior of the world. Well, not so fast. The Hudson Valley Project proves otherwise and is a great antidote to our pervasive mono culture farming that is doing harm in many ways.